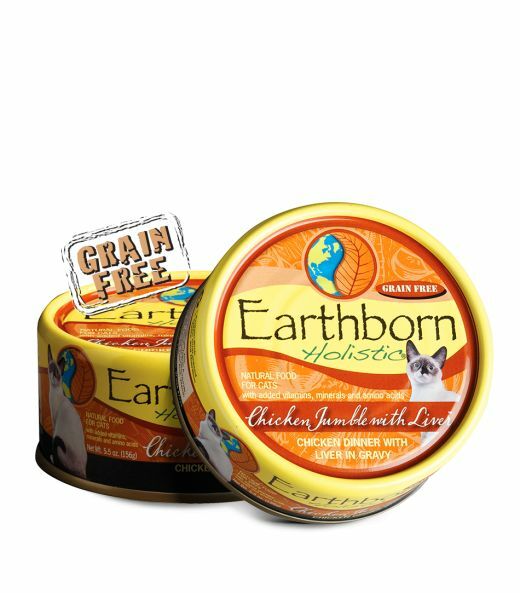 Earthborn Holistic® Chicken Jumble with Liver™ Chicken Dinner with Liver in Gravy combines boneless, skinless white meat chicken and aromatic chicken liver in a savory gravy sauce to provide a strong taste and aroma that cats crave. This grain and gluten-free dinner also includes chunky potatoes as an exceptional source of vitamins, minerals and beta-carotene, which supports a strong immune system. Designed with your cat in mind, this formula will give your cat the nutrition he needs to live a long and happy life. Chicken Broth, Chicken, Potatoes, Chicken Liver, Sunflower Oil, Dried Egg Product, Natural Flavors, Tricalcium Phosphate, Guar Gum, Potassium Chloride, Magnesium Sulfate, Salt, Taurine, Choline Chloride, Vitamin E Supplement, Zinc Oxide, Iron Proteinate, Thiamine Mononitrate, Niacin, Sodium Selenite, Vitamin A Supplement, Manganese Sulfate, Copper Proteinate, Pyridoxine Hydrochloride, Calcium Pantothenate, Riboflavin Supplement, Folic Acid, Vitamin B12 Supplement, Potassium Iodide, Vitamin D3 Supplement, Biotin.